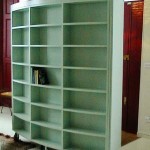 Large mobile unit with bookshelves on one side and cupboard for coats and drawers for shoes on the other. Bi-fold panels at each end can be opened out to conceal the large open plan sitting room from the open front door. 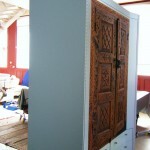 Coat cupboard and shoe drawers side, incorporating clients’ carved doors.